I REALLY have to stop getting bánh mì at non-Vietnamese restaurants. I keep doing this, and it’s never good. I know it isn’t going to be good, but I keep doing it. I really got into bánh mì on our trip to Vietnam. We have a ton of Vietnamese restaurants in the Denver area, many of which are dedicated to bánh mì or at least serve it. However, most are in one area of town that we have to make a special trip to. Given that my wife isn’t as into something so bread-focused and that the same neighborhood has a ton of other restaurants she prefers instead, it’s really hard to get her to do down there just so I can have a bánh mì. As such, I rarely get to go where I know I should for them. Instead, I keep seeing them on the menu at other places, non-Vietnamese places. Chain places. Alamo Drafthouse. Zeps Epiq Sandwiches. They aren’t bad for other food, but I KNOW they aren’t going to do bánh mì right. They are going to do their own take on it, which will be horrible for anyone who likes real bánh mì. I KNOW this, but I keep ordering it because I like bánh mì so much. I keep telling myself when I order it will be good enough, that I’d rather have fake bánh mì than none at all, but then the same disappointing result happens when I eat…just as I knew it would the whole time. I wish an actual bánh mì place would open closer to my house. 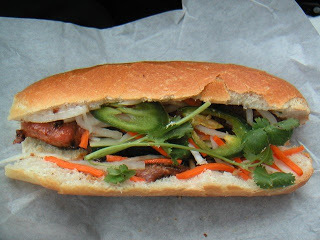 This entry was posted in Uncategorized and tagged Bánh mì, Bánh mì vietnam, Bánh mì vietnamese, vietnam, vietnam restaurant, vietnamese, vietnamese restaurant. Bookmark the permalink.